Indulge in the flavors of France at one of Michigan’s elegant French eateries. You’ll find some of the best French cuisine across the state. Whether it’s beef bourguignon from a bistro or a celebrity chef-approved café, these eateries will surely satisfy! Here are the 10 best French restaurants in the state. Grand Rapids' Euro Bistro is one of West Michigan's biggest names in French food. Yet even here, the Michigan influence shines through thanks to dishes like Perch Meuniere. 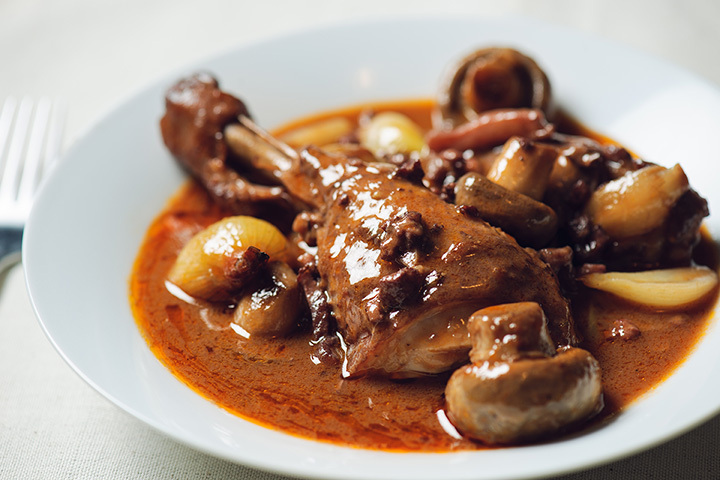 Still, for fans of the classics, there's Coq au vin and beef bourguignon sufficient to satisfy any, along with a top-notch wine list. The Henderson Castle Inn in Kalamazoo tops a lot of different lists. A high-end bed and breakfast with spa facilities, there's a lot to like here, but it's also the leading French restaurant Kalamazoo boasts. Prepared by Master Chef Francois Moyet, there's a great variety here, and Moyet takes great pains to select his own ingredients, often locally where possible. Operating in Muskegon since 1975, under one banner or another, the Hearthstone Bistro offers up an experience all its own. Boasting several French options—along with a little Italian and American to round things out—from escargot to quiche and beyond. Those merely traveling with those who prefer French food will find plenty of options as well, making for a wonderfully versatile experience. Welcome to Maple City, where the La Becasse—French for "the woodcock"—offers up French country cuisine at its best. A winner of Wine Spectator's Award of Excellence in 2012, La Becasse starts with escargot and works its way into a duck confit and rack of lamb on par with the best. And then there's the dessert, starting with creme brulee and tarte tatin and ending with a cheese plate, just to finish the whole thing off. Cafe Sante in Boyne City comes with a bit of backstory to it. This home of "European classics" that serves all three meals was once visited by no less than Chef Mario Batali. Batali asked a local writer where to eat, and found Cafe Santi. Batali later thanked said writer, noting that it was "more than (the writer) said it would be." That's no small praise from a celebrity chef, so hit Cafe Santi to see what surpasses his expectations. Head to Charlevoix for the most on-the-nose named French restaurant in the state. Yes, it's really called "That French Place.” Classic. They'll not only offer up such fare as crepes and pain au chocolat, but they'll also ofer up a complete slate of dinners to go in the colder months, which can be a huge step to brighten up a Michigan winter. Try the chicken cordon bleu or the coq au vin. Thank you, Traverse City, for once again proving that you've got everything from arcades to food trucks to even top-notch French restaurants. Start with escargot or a cheese plate, then work your way up to ratatouille or bouillabaisse, among others. Then finish it off with creme brulee, a hazelnut crepe, or several other options including a seasonal-fruit crisp. Lansing's EnVie is a comparatively new addition, offering bistro-style fare in the midst of Lansing's downtown. EnVie offers a rotating menu that features different dishes with the seasons. Summer's menu, for example, boasts cassoulet, salmon tartare, and a croque monsieur/madame among others. Who knows what will show up in fall or winter, so swing in and have a look, while you can! Mikette brings what it describes as "a taste of southern France" to Ann Arbor, which opens up some rather exciting possibilities. With a distinct lunch and dinner menu, it's clear Mikette is taking things seriously from go, and it follows this up with some rather exciting options. Start yourself out with L'as du Fallafel, rue de rosier, paris, and work up to gougeres and mussels provencal, and that's before you leave the appetizer menu. Small surprise that Detroit's got one of Michigan's great French restaurants. Even the word Detroit means "strait" in French, with the French calling the Detroit River "Le Detroit du Lac Erie." But Le Petit Zinc is more than just French in name only, but in menu as well. Start your day with crepes or a French-style breakfast, and if you show up later in the day, try some ratatouille, saucisson cornichons, or any of several other options.